Let us get you back to work or play!! This includes the use of electrical stimulation, ultrasound, moist heat therapy, cold therapy, and paraffin wax treatments to assist the patient in the healing process. Electrical Stimulation, also known as E-Stim, uses an electrical current to cause a single muscle or a group of muscles to contract. 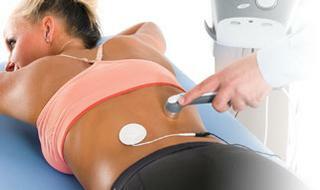 By placing electrodes on the skin in various locations, the physical therapist can recruit the appropriate muscle fibers. 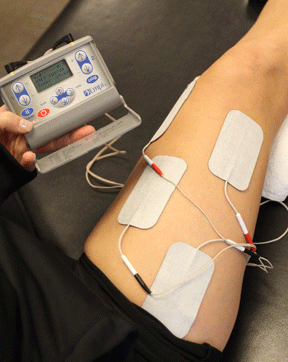 Contracting the muscle via electrical stimulation helps strengthen the affected muscle. The physical therapist can change the current setting to allow for a forceful or gentle muscle contraction. Along with increasing muscle strength, the contraction of the muscle also promotes blood supply to the area, which assists in healing. This involves sound waves transformed into a penetrating heat by a piezo electric crystal into soft tissue. Heat causes a local rise in temperature and metabolic production; local blood flow increases to dissipate the heat and supply additional oxygen to healing tissues. Analgesia, muscle relaxation, and sedation are additional effects of the increase in temperature. Local heat is indicated in the treatment of chronic soft tissue injuries. Heat aids in the relief of muscle spasms and helps to increase range of motion and flexibility. Cold therapy has a cooling effect. The result of this is a reduction in local blood flow, metabolism, and the reduction of swelling and edema. Cold therapy is also a very effective local anesthetic. 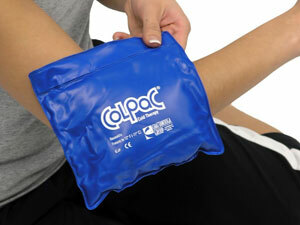 Local cold therapy is useful on soft tissue injuries such as contusions, strains, and sprains. It is also indicated for relief of pain and muscle spasms. The Paraffin wax is heated to about 125 degrees. It is applied to the hand and wrist area using a large soft brush; several layers are applied until the skin is completely covered in a silky glove of wax. The hand and wrist are then covered in Clingfilm and wrapped in toweling mitts for 15 to 20 minutes. This allows the warm soothing benefits of the treatment to work. The toweling mitts and Clingfilm are then removed and the Paraffin Wax is carefully peeled off. This treatment can help ease stiffness and discomfort of the joints. As the name implies this refers to the use of the “hands-on” treatment, which involves specialized techniques used by the therapist to accelerate healing and decrease pain. Examples include The McKenzie Method. Evaluations by a licensed physical therapist include assessment of joint motion, stability, flexibility, muscle strength and endurance, and the ability to perform daily activities. Patients receive individualized treatment plans, advanced hands-on therapy techniques, and evidence based protocols to achieve realistic rehabilitation goals. This refers to the use of evidence based protocols specific to the injury sustained. Hydro massage is an unattended modality that provides relief from pain by jets of warm water to massage the soft tissues of the body. The heat and massaging action of the water work together to help improve circulation, relieve muscle tension and stiffness, release trigger points, increase range of motion, release pressure on nerves, and promote general relaxation. The patient lies completely clothed on the surface of the table. Just under the surface is a mattress filled with heated water. A pump propels the water toward the patient through three patented hydro-jets. The pressure of the water against the patient’s body provides very effective deep tissue massage. "Sidmar.com"